In this buyer’s guide, we’ll review the 8 best tennis ball machines in 2019, so you don’t have to break the bank to practice your return. We’ll look at the best options in terms of features and build quality as well as the best tennis ball machines available for under $1000. In a rush? Check out our handy comparison table to view our top picks, or jump to our reviews. Already know what you’re looking for? Skip straight to the best machines under $1000 or the best machines overall. Why buy a tennis ball machine? 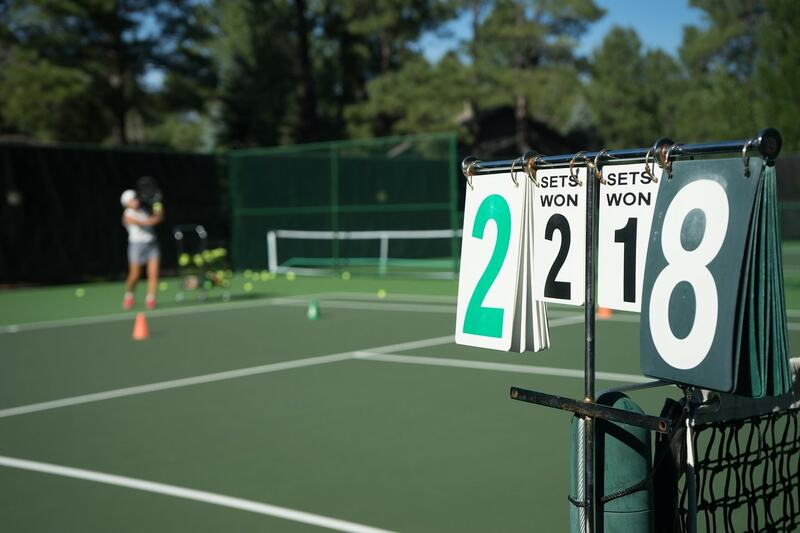 Quite simply: tennis ball machines allow you to train scientifically – finding and eliminating the weak points in your game that could be costing you matches. Say you notice you’re mistiming your half-volleys – sending them too high and allowing for an easy return. On the training court, you can set your machine to pitch the ball so it bounces nearly at your feet, allowing you to practice returning the balls you’re struggling with. After an hour or so of practice, you should notice a significant improvement in your ability to hit the ball exactly where you want it. But that’s not to say that tennis ball machines are boring and predictable. Most machines have a feature called oscillation, meaning they can fire shots on both sides of the court and vary how deep they shoot. Some can even be set to fire randomly, which is a great way of improving your reflexes and movement speed on the court. Feed rate (how fast you can set the machine to fire). Battery life – most tennis ball machines run on battery power only. How big do I want the machine to be? Could I lift a large machine into my car, and would it fit? Would I prefer the peace of mind of a longer warranty? How will my new machine help me to lift my game? Do I need a cheaper beginner’s model to work on basic returns, or an advanced machine to put me through some complex drills? Is my fitness and endurance something I want to work on? If so, should I opt for a machine with a larger ball capacity and a faster feed rate? Just a quick word with regards to portability: some machines can fold down (or the hopper can be taken off) to save space. Look for these options if you’ve only got a small car. Also be on the lookout for machines with wheels and a handle – carrying around a 50 pound hunk of metal isn’t much fun! How are tennis ball machines powered? Nearly all tennis ball machines come with a battery these days, which will last around 4-8 hours. This means you won’t have to worry about finding an outlet near the court. However, there are a few higher-end machines which can be plugged into the mains. Most manufacturers also sell an AC/DC power kit you can use to plug battery-powered machines into a wall outlet while still having the option to go back to battery power later on. However, these addons can be quite expensive. The two best tennis ball machine manufacturers on the market right now are Lobster Sports and Spinshot. For the most part, the different machines each company makes are quite similar in terms of what they offer. 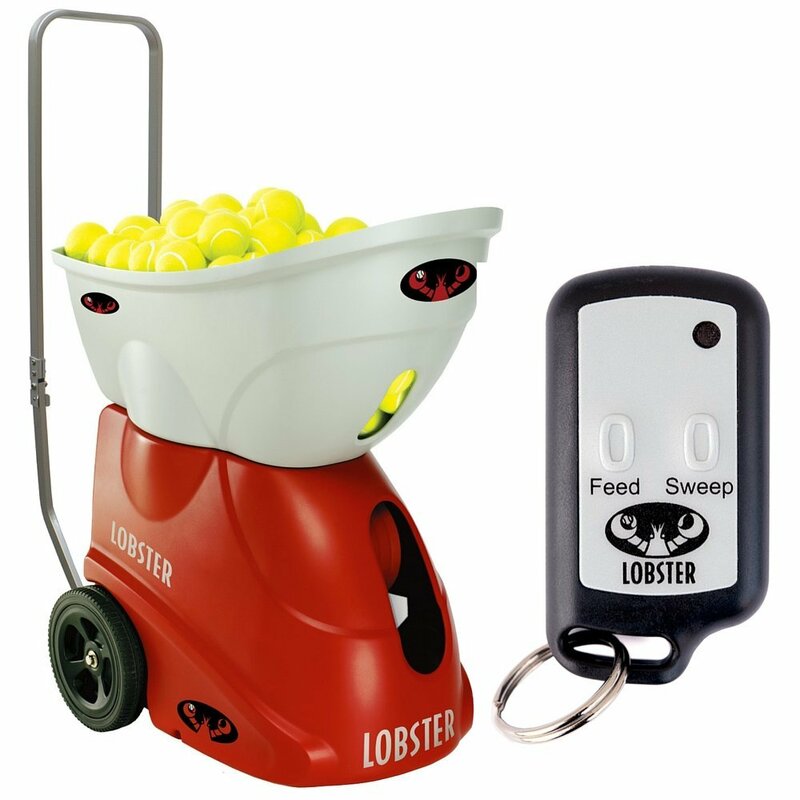 Lobster Sports’ tennis ball machines each come with a 2-year warranty, and an 150-ball hopper capacity. Nearly all of their machines will fire at up to 80mph. Similarly, most Spinshot machines come with a 2-year warranty, but the battery is only covered for 6 months. Their machines also tend to have a lower ball capacity and slightly slower top speed. What Spinshot is good at is delivering innovative features. Even their cheaper options (like the Spinshot Player) can memorise programmable drills, and can be controlled with a mobile app. Lobster will try to charge you extra for their smartphone/smartwatch module – instead they include a basic remote control with most of their products. As long as you stick with reputable brands (like the two we just mentioned), you won’t have any problems with your machine breaking. If you do happen to get a defective unit, you’ll be covered under the 2-year warranty anyway. The one thing to look out for though is the battery degrading over time. After a few years’ use, you might notice that a full charge only lasts 2-3 hours rather than 5-6. You can order replacement batteries from the manufacturer though, and normally they’re easy enough to install. Lobster Elite Liberty Tennis Ball Machine. First, we’ll look at the best tennis ball machines for the money on the market right now. Most beginner/junior tennis players don’t really need a heap of fancy spin-control features and drill presets. As a result, you can get a really nice bare-bones machine for much less than $1000. The Match Mate Rookie is just what you need to get started on your tennis journey. Its five hour battery life ensures that the kids get tired before the machine does, allowing them to hone their returns throughout an afternoon session. What’s more, it only weighs 22 pounds, so there’ll be no complaining when you put them on pack-up duty! However, it’s the machine’s settings that make it suitable for all rookies, not just kids. It can be adjusted to fire at up to 28mph, enabling you to develop your technique at your own pace. This machine doesn’t have custom spin or oscillation settings, making it all the more suitable for beginner players who aren’t quite ready to deal with crazy-unpredictable shots. Slow, adjustable speed settings – great for kids. No custom spin or oscillation options. Lobster Sport’s mid-budget option has a whole heap of awesome features for beginner to intermediate level players. It comes with a lob shot function, holds around to 150 balls, and can fire at up to 80mph. Hold up, this is supposed to be the “less than $1000” section! It is! The Elite Liberty model comes in at just under four figures, making it excellent value for money considering what you get. At 35 pounds it’s still very light, and the wheels allow for easy portability. You can even tell it to shoot with topspin or backspin, and it has a horizontal oscillation function. Plus, you get a 2-year manufacturer’s warranty for peace of mind when buying. The only downside is the battery, which is advertised to last between 2-4 hours. This should be plenty for most players, but if you’ll be on the court for 5+ hours at a time it’s probably a good idea to look at a more advanced machine with a longer maximum battery life. Has everything you would want as a beginner-intermediate player. 2-4 hour on court time. An even cheaper option is this ultra-compact machine in the Spinshot lineup. The Spinshot Light is basically designed for junior players. It can only fire at up to 37mph, which is quite a bit slower than most other models, but still a little faster than the Match Mate Rookie. While this machine doesn’t have any oscillation settings or programable drills, its battery supports up to an incredible 7 hours of play. The best thing about this tennis ball machine though is how portable it is. It’s the smallest option on this list, at 10 inches wide/deep by only 16 inches tall. What’s more, it’s very light, at only 22lbs, meaning it’s easy to get in your car. Despite this, the hopper can hold an impressive 50 balls, and you can adjust the feed rate from once every 2 seconds up to once every 10 seconds. Essentially, this machine is a better version of the Match Mate Rookie. Although it’s a tad more expensive than its budget counterpart, you definitely get what you pay for – Spinshot even include a 2-year warranty against defects. No programmable drills, spin settings, or oscillation options. Lobster Sports Elite Two tennis ball machine. Looking for the best-possible ball machine? In this section we’ll review some of the best tennis ball machines in terms of overall build quality and features, while still assessing the comparative value of each device. If you’re looking for the best tennis ball machine in terms of its ability to recreate the sort of situations you face in a real game, the Spinshot Player is an excellent choice. You may have noticed that we haven’t included Spinshot’s cheaper “Pro” model in this review. This is because even though it costs more than the Lobster Sports Elite Liberty, its features are pretty much the same and the warranty is a year shorter. A phone app that allows you to create and edit your own custom drills, including editing the feed rate, spin and power of individual shots in your routine. 2-year warranty (6 months for the battery). This machine would be great for intermediate-advanced players looking to use highly targeted tennis drills to take their game to the next level. You also get the convenience of the phone remote and the electronic elevation settings. Plus, if you’re a beginner, you can “grow into” the machine and start using its more advanced drills as your returns improve – only trying out its basic routines to begin with. The only downsides (apart from the cost) would be the battery (which only lasts up to 3 hours) and the relatively low 68mph top shot speed. You’ll have to decide whether you need a more powerful machine or not. The video below gives a good demonstration of the oomph of the Spinshot Player. Massive range of preset drills – and you can make your own, including with custom individual shots. 2-3 hour on court time. Only fires at up to 68mph. 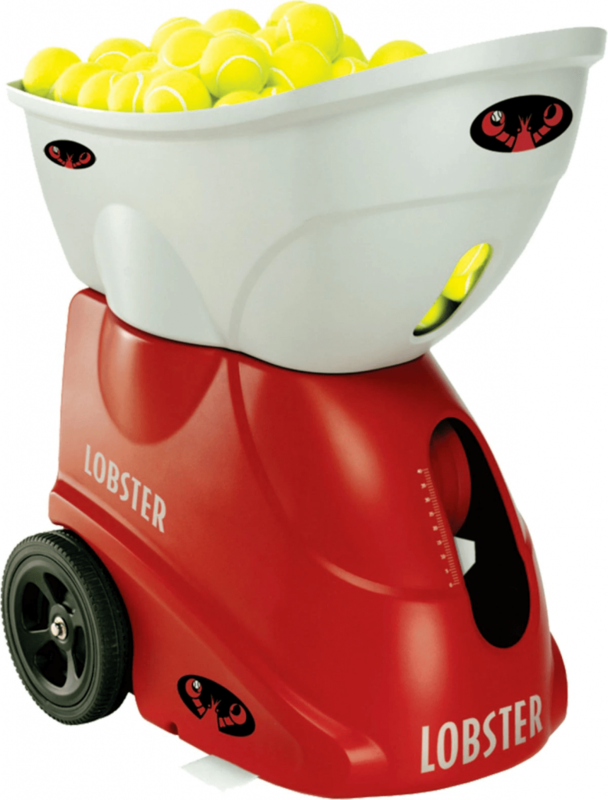 Another mid-upper budget option is the Lobster Sports Elite Two tennis ball machine. This device is a tad more expensive than the Spinshot Player we just looked at. In return, you get a much longer battery life – this thing will keep going for up to 8 hours, which is very impressive. It also comes with an extra-large 150-ball hopper, which you can detach to save space in transit. Using the “triple-oscillation” functionality, it’s possible to get a real workout with this ball machine. Rather than making an app to go with their product, Lobster have designed their own little remote to control the Elite Two. You can do basically anything with this device, including controling shot power, spin settings, oscillation, and feed frequency. The only thing it won’t do is move the actual machine! The Elite Two also has pretty impressive stats. It’ll feed at up to 80mph, and the electronic tilt mechanism will angle the machine at anything from 0-60°, allowing you to practice returning lob shots. Unfortunately, the Elite Two doesn’t come with programmable drills. That’s the only thing it’s missing really – apart from that, this machine is an excellent all-around option. Highly customizable spin, oscillation and elevation settings. No mobile app or programmable shot routine function. As these two machines cost a similar amount and offer similar features, we thought we’d pit them against each other to see who comes out on top. Functionality: you can program it with your phone and make your own drills. Price: generally a bit lower. Hopper capacity: 150 vs 120. Max speed: 80mph vs 68mph. Court time: 4-8 hours vs 2-3 hours. Portability: the hopper can be removed, making it easy to fit in your car. THE VERDICT: Lobster Elite Two wins! Since all other factors are pretty much equal (the warranties are both 2 years long, both have horizontal/vertical oscillation etc.) we think the Elite Two just about trumps the Spinshot Player. Although it’s a little more expensive, the battery life and faster max speed more than makes up for it. However, if you particularly want programmable drills or a mobile app, the Spinshot Player is still a fantastic choice. Looking to get the best-possible value for money? Lobster Sports make a slightly cheaper version of their Elite Two model, called the Elite One. Surprisingly, this machine is quite similar to the upgraded version. It has the same maximum tilt angle, the same ball capacity (150), the same weight, and comes with the same two-year warranty. So why wouldn’t you buy the Elite One? What this tennis ball machine lacks is the multifunctional remote that comes with the higher-end model. You still get a remote, but it only controls the sweep and feed rate settings – not the ball power and full oscillation. Importantly, its random oscillation settings aren’t as advanced. While you can do random vertical, random horizontal, and random vertical/horizontal with the Elite Two, with this machine you can only do random horizontal oscillation. Meaning, it’s a little harder to make super-unpredictable drills. Considering the price though, this machine is still an excellent buy for intermediate players. Up to 8-hour battery life. This is quite possibly the best tennis ball machine in terms of overall performance. It’s not cheap though! Because the Phenom II is as tall as a small child, it can hold up to 250 balls – which it can place anywhere you like on the court. You can also program your own drills and save them to the machine, although it doesn’t come with a phone app and the remote is sold separately. There’s also a heap of specialized drills, such as the attack/defend routine developed by Lobster’s experts, which are sure to put you through your paces. It even has random spin and vertical oscillation modes to really mix things up. Although this is a really incredible machine, it’s definitely not for everyone. It weighs 99 pounds and is 50 inches tall, so lugging it to and from the court might be a bit difficult. It’s powered by the mains (AC) rather than with a battery, so you’ll need a power outlet somewhere close by to use it. Essentially, if you’re buying for a tennis club or you own your own court, the Phenom II might be worth taking a look at. It’s honestly the best tennis machine that money can buy in many respects, so check it out and see if you think it’s worth the price. You can program and save your own drills, and there are preset routines. Heaps of randomization, oscillation and spin settings. Big and bulky – although the wheels make it easy to move. Need an awesome but highly portable tennis ball machine? 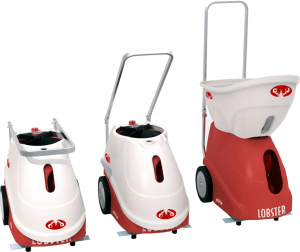 Lobster also make an “Elite Grand” line of high-spec machines. This particular one – the Elite Grand Five – has similar specs to the Phenom II we just looked at. It comes with 12 pre-loaded, editable drills, allowing you to develop the best training regime for your specific needs. You can set completely random oscillation, and it comes with a 20-function remote. However, unlike the Phenom II, this machine is small enough to get in your car. The downside to this is that it’ll only hold 150 balls, rather than 250. This is also a very expensive machine, especially considering its hopper size. On the plus side though, the Elite Grand Five machine is battery-powered, and there’s an AC converter accessory you can buy to run it on mains power. It’s also possible to control the machine through your phone or Apple Watch, but this requires a part you’ll have to buy from Lobster and install yourself. Comes with 12 editable drills. We’ve put together a handy Google Sheet that compares each tennis ball machine we’ve reviewed based on their specifications and features. The truth is there’s more to using your “silent partner” than just ordering the machine. No matter which option you go for, your beast is going to be hungry. It’ll devour tennis balls like you eat Coco Pops. We recommend grabbing a bulk bucket of pressureless tennis balls as they last longer than the pressured variety. Check out our guide to buying the right tennis balls for more info on the subject. Penn’s 48-ball bucket and Tourna’s 60-ball pack are great places to start. What’s more – the more you feed it, the more you’ve got to pick up its mess. No one wants to break their back bending down to pick up 150 individual tennis balls. You’ll want something to make this process a bit easier. These devices work as a basket to pick up the balls and then as a stand to hold them – the handles fold down to function as legs. You can pick up balls from one end and empty from the other. A bit more time-consuming than using a ballport but a little cheaper. Finally, there’s the issue of protecting your investment from the weather. Tennis ball machine companies sell separate protective covers for their machines which we think should really come as standard. Do you really need a cover? Probably not. But if you play in the rain, or your storage location is a bit damp, it can be worth getting one to protect the electrics from moisture. Remember most manufacturers don’t cover the weather as a part of their warranty. If you think these covers are too expensive, just use a piece of waterproof tarp and a rope to secure it when storing your tennis ball machine. You’ve reached the end of our buyer’s guide! Hopefully you found what you were looking for. Still not sure which tennis ball machine is right for you? Leave a comment and we’ll get right back to you!